So how does an artist, in my case a poet, of faith, respond to the call of beauty? How to find meaning in Creation and channel it into art? We gloried in the springtime grasses along the roadsides and in all the early, glowing green that fills up the lacunae between Washington's deciduous tree branches and earth and sky. It was the time of year when the whole world glistens, fresh, hung with diamonds after the showers, emitting its own variety of subdued radiance. And when the sun opens up like an eye, it all comes vividly alive, breathing a kind of herbal joy. "Now the green blade riseth from the buried grain." Two weeks after Easter our congregation sang this wonderful French spring carol during Sunday morning worship. drinks from the root below. I love the conclusion of our Sunday hymn: "Love is come again, like wheat that springeth green." It is God's grace, his deep affection for us and his Creation, his creative nature springing up in us that brings this revival of green life to our senses, our souls. We were created to create. It is our calling to celebrate the pattern of new life from God. loose brown vine the new green buds began to droop and die. So I cut the whole thing back to the ground, hoping for new growth. Just weeks later I noticed a happy young shoot poking up from the soil. It's hard to suppress that kind of importunate life. In herbs. In human beings. In art. "Though there are few giant leaps in my life, I too am trusting for God's slow cultivation to happen in me as a Christian and as an artist, day by day." In a New Yorker article on experiments in quantum mechanics suggesting the possibilities of multiple universes, I came across the statement: "The universe, if viewed from the outside, is beige." With that note of disillusionment in mind, John and I drove down to Mt. Vernon in the Skagit Valley one spring Sunday afternoon to view hundreds of acres of tulips opening up and blooming brilliantly. Massed red, yellow, purple, pink, flame-color, white. Even in the crook of an ancient apple tree, scaled with moss and lichen, came the surprise — like an unlikely metaphor showing up in a poem — of scarlet tulips growing high among the branches. Such dazzling color paints itself in my imagination, too real to be washed away by the theories of physicists. Even in the rain, with the grayed-out Cascade Mountains in the far background, the vivid intensity of those fields fill my memory with their pigments. All of us, whether novelists, teachers, painters, dancers, dramatists, or journalists are called to prepare ourselves like canvases for creative endeavors. As we do so, we can count on being continually painted on by our God in the colors of creation, colors brought to life by the creative imagination. 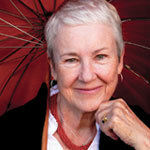 Luci Shaw is a writer and author of many books of poetry and prose. She and her husband live in Bellingham, Washington, where she is an avid gardener. She is writer in residence at Regent College in Vancouver, Canada.